I saw a t-shirt at the market last week and it made me smile, so much so that I bought it as a Christmas gift for someone special. It said "It's not rocket surgery", a play on "it's not rocket science" and "it's not brain surgery". Becoming more self-sufficient can help you save money in a wide variety of different ways, and that's not rocket surgery either. Self-sufficiency doesn't mean you need to give up the conveniences of modern living, or live on mung beans and brown rice or spin your own yarn to knit into clothing. It simply means you take on the things you can do for yourself that you may otherwise have outsourced and paid for. Being self-sufficient includes growing your own vegetables and cooking from scratch. It also includes mowing the lawn or washing the car instead of paying a gardener or driving through the car wash, saving that money for other things. The first most obvious way to increase your self-sufficiency is to grow your own food. 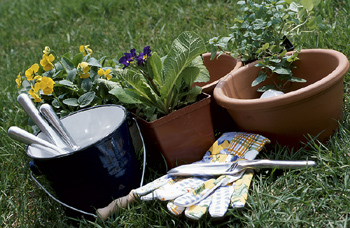 If you don't already, grow your own fruits, vegetables, spices and herbs. There are a so many different ways that you can grow your own food, including planting your own vegetable garden, growing non-hybrid vegetables and harvesting your own seeds, and using square foot gardening techniques in order to grow a lot of food in very small spaces. Take the capabilities of your garden further by using organic mulch from local sources and using homemade compost or free manure in order to enrich the soil in your garden and you won't have to use commercial fertilizers, another dollar saving. If you're just getting started, try growing potatoes. The humble spud is an easy crop to grow, albeit a little on the slow side. You can grow your own potatoes inexpensively (I grow our spuds in bags), then save the fingerling potatoes to plant next year. Nurseries keep seed potatoes, or you can order lovely heirloom varieties from the Diggers Club. Another huge food expense for most of us is fruit. Consider creating your own small orchard and growing your own fruit, it's easier than you think. You can even get planter-pot-size varieties of many fruit trees. We have a mini orchard, of dwarf fruit trees, all in pots. We have lemon, grapefruit, mandarin, cumquat, lime, plum and orange trees, all growing happily in pots in our backyard. In the front yard we have a beautiful apple tree, that gives us enough apples to freeze and dry for the winter. Australia has a wonderful growing season, but if you live in the south, winters are a little on the chilly side. Extend your growing season by building your own greenhouse. There are DIY options as well as kits that you can buy and assemble in a variety of shapes, sizes, and styles. You can even get small "disposable" greenhouses from garden centres for around $20, and guess what - you don't have to dispose of them, you can just keep on using them all year round. Another way to increase your self-sufficiency is to utilize natural resources. There are a variety of ways that you can utilize renewable, natural resources in order to be more self-sufficient, saving money in the process. For instance we cut and collect our own firewood rather than buying it. We make a day of it, taking a picnic lunch and the chainsaw and off we go. Two or three trailer loads a year keep us in firewood for the winter for just the cost of petrol, saving us around $450 a year if we were to buy it. This may seem like another no-brainer, but collect rainwater for use in watering your plants and other purposes instead of relying on mains water. Water tanks and barrels come in all shapes, sizes and colours so you're sure to find something to suit your needs. You can even recycle plastic bins to collect rainwater to use in the garden. Water is a precious resource, and one we often take for granted, until we get the bill. Then we whinge about how much it costs. Rain water you collect is free. Perhaps collecting rainwater really is a no-brainer after all. One thing we are not short of in Australia is sunshine. Supplement the heating system in your home by installing solar heating panels. You can also supplement your home's water heating needs using the same panels. Install solar power and get paid (every little bit helps) to feed back into the grid. Perhaps you'll be able to generate enough power to completely do away with power bills. I mentioned growing your own food earlier. Now I'm going to suggest you might be able to raise your own food. Depending on where you live and the amount of land you have, you can raise chickens, sheep, goats or even bees - not only to create your own food, but for other materials as well. You can raise chickens for eggs and meat, goats or cows for milk products, pigs and other animals for meat. Keeping more than chickens isn't possible in suburbia but if you live rural, a house cow or goat for milk and raising lambs or calves for meat is not only a way to save money, but to ensure you get good organic meat and milk. On that note, goats and sheep can also provide you with materials for spinning, knitting and crochet. If you learn how to spin wool into yarn, you can make some of your own clothing, blankets, towels and other necessities. Part of being self-sufficient is not relying on supermarkets so you need to store what you grow and raise. Consider learning how to bottle, freeze and dehydrate foods so you can preserve some of the food you grow and some of what you cook, like soups, and enjoy food all year long based on what you grow from season to season. Preserving isn't the time consuming chore it used to be, there are so many modern appliances around it's a simple task, often done in just a few minutes. Use and reuse. Reduce, reuse, and recycle may be an overused adage, but when you use and reuse whatever you can as much as possible, you reduce waste and find new and creative ways to become more self-sufficient and save money in the process. The more you can reuse, the less you have to buy, the more money you have to spend on other things. Now that really isn't rocket science, it's just commonsense. There are so many ways that you can become more self-sufficient without giving up your lifestyle. Be conscious of alternative techniques to improve your health and well being, your impact on the environment, and your wallet, and you may find other ways to increase your self-reliance as well. What you do in order to increase your self-sufficiency should be a personal choice, and it can take time to properly discipline yourself to meet these goals, so be patient as you adopt this new way to save money. I am working my way towards self sufficiency and part od that is to knit all my husband's and my clothes. I began learning to knit about 2 years ago - and am passionate about it! We cook everything we can, grow what we can, preserve and even spin my own wool too. All this has taken time to learn these skills. I have preserving books and recipe books and read blogs on self-sufficiency - and try new things to see if I may like to incorporate them in my lifestyle (I'll be trying felting soon). The biggest thing to work on is time management. In the summer when it's time to preserve you need to make sure you have the time to do it. It's about organising you time and housework too. It's about learning a skill you enjoy and seeing how to incorporate it into self sufficiency. It's a great lifestyle - and you're independent from the big supermarkets! Pumpkins are a great beginner crop: save seeds from any bought pumpkin, toss them into a sunny spot in the garden in spring, keep watered, and they should fruit pretty easily!